If you know any Maple Leafs fans, you may have noticed that they’ve been even crankier than usual over the past few days. That’s because last week marked the 25th anniversary of one of the worst trades in the history of hockey: the Tom Kurvers deal. The notorious trade went down on October 16, 1989, and saw New Jersey send Kurvers to Toronto in exchange for a first-round pick in the 1991 draft. Kurvers was a decent enough offensive defenseman, but the Maple Leafs were terrible, and the pick ended up being third overall. The Devils used it to select Scott Niedermayer, and the rest is history. All of that makes the deal bad enough, but it may have actually been even worse. The Leafs nearly finished dead last in 1990-91, which would have given the Devils the first overall pick. And they would have used that pick on arguably the most heavily hyped prospect the league had ever seen: Eric Lindros, a junior powerhouse who was considered a sure thing to become the next Gretzky or Lemieux. Once they realized how badly they’d screwed up, the Leafs went into scramble mode to make sure they didn’t finish last. At one point, they even made a laughable deal with last-place Quebec, acquiring several veterans in exchange for picks and prospects in a transparent attempt to try to help the Nordiques tank. It worked — barely. The two teams were tied for last overall as late as February, before the Leafs finally strung together just enough wins to escape infamy. It all worked out wonderfully for the Devils; in hindsight, Niedermayer went on to have the better career, largely because of Lindros’s injuries and disputes with various teams’ management. But the fact remains that if they hadn’t made the Kurvers trade, there’s an excellent chance the Maple Leafs would have out-tanked the Nordiques, finished last in 1991, and drafted Lindros. Like most Maple Leafs fans, I’ve spent far too much time imagining an alternate reality in which this horrible trade had never taken place. And it turns out that doing so can be an interesting exercise, because if you leave Kurvers in New Jersey and accept that doing so means the Leafs end up finishing last, a surprisingly big chunk of NHL history starts to unravel. 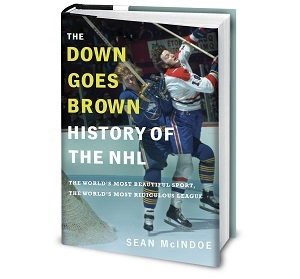 So just for fun (and maybe a little bit of psychotherapy for Leafs fans), here’s an alternate history of the NHL, offering up a lesson on how one awful trade can change just about everything. October 16, 1989, in Newark, New Jersey: Tom Kurvers had heard the rumors that a deal was close, and today, the phone call he’d been waiting for finally came: The 27-year-old defenseman is on the move. After speaking to his realtor and confirming that his offer on a new apartment had been accepted, Kurvers said a quick good-bye to teammates before heading home to start packing. He won’t have much time, since he’s expected to be back in time for practice tomorrow. Nothing else interesting happened to Kurvers today. June 22, 1991, in Buffalo, New York: In a moment that came as no surprise to anyone, Eric Lindros was chosen with the first overall pick of today’s NHL entry draft. The heavily hyped prospect was selected by the Toronto Maple Leafs, who held the top pick by virtue of their last-place finish during the 1990-91 season. The expansion San Jose Sharks took Pat Falloon with the second overall pick. The first defenseman taken was Kamloops Blazers blueliner Scott Niedermayer, who went to the Quebec Nordiques third overall. January 2, 1992, in Calgary, Alberta: Doug Gilmour’s midseason holdout dragged on today, with no trade in sight for the disgruntled Flames center. The former All-Star is unhappy with his contract and recently walked out on the team in an attempt to force a trade. The rumor mill has speculated he’d prefer to go to a big-market team. However, that could be easier said than done, since many of the league’s larger markets already have clearly established first-line centers, including Los Angeles (Wayne Gretzky), New York (Mark Messier), and Toronto (Lindros). One team that could be a fit is the Philadelphia Flyers, who have been known to be on the market for a top center, and are said to be willing to make a blockbuster deal under the right circumstances. However, one scout suggested that the team may be better off filling that void by convincing last year’s first-round pick, Swedish prospect Peter Forsberg, to head to North America and put on the orange and black. I challenge you to top this blog. This is the best. As a Devils fan this fantasy was really a nightmare....Never leave us Lou. "The Legion of Two Huge Guys With One Smaller Guy in the Middle" was fantastic. Old school DGB post instead of this slightly-humorous-sportswriter stuff we get nowadays. Get a grip Sean, it's 2014, act like it. Milbury in New Jersey. You wouldn’t be that cruel. Although the subsequent scatter of Devils all-stars around the league might be interesting.